Sometimes it takes me a while to gather up my photos and put together one of these posts. This one took just a bit over 41 years. Linda and I took our first driving trip across the Southwest in July, 1971, following my discharge from the Army. We were driving home from Texas to Minnesota so, naturally, we took the scenic route along the Pacific Ocean. As we approached Las Vegas, we stopped at Hoover Dam and I took this picture. There have been numerous books written about the construction of Boulder Dam (subsequently renamed Hoover Dam) but I stumbled onto one very simple book about it. This Zane Grey novel, Boulder Dam, published in 1963, years after Grey died. In it, Grey's hero, Biff, works at eleven different jobs on the construction site. I recommend it just for a view of construction work and Boulder City in the 1930s. And a lot of pictures have been taken of the dam and of its construction. 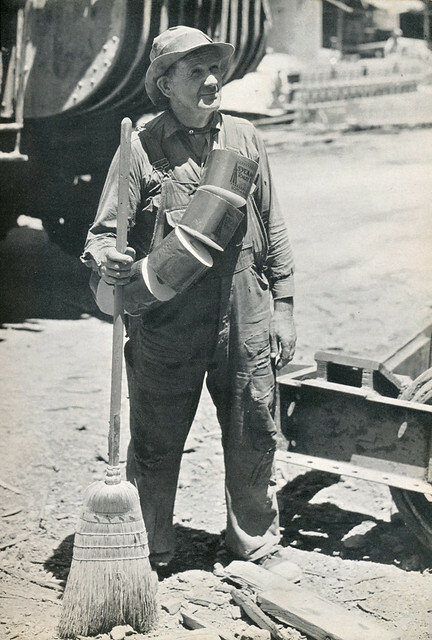 If you see a picture of workers toiling away on Boulder Dam, there's a pretty good chance that it was taken by Ben Glaha who was hired to document the project. Glaha was a very talented and artistic photographer and a book of his work at the dam was published in 1999 by Santa Barbara art professor, Barbara Vilander. About four years ago, we were passing through the desert Southwest again, and happened upon the Boulder Dam Hotel in Boulder City. Well, that's not quite accurate. Linda's sister lives in Boulder City and she knew that this was they kind of hotel that we would love. 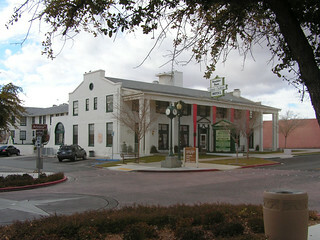 It's on the National Register of Historic Places and has an elegant lobby with lots of historic photos. She was right. 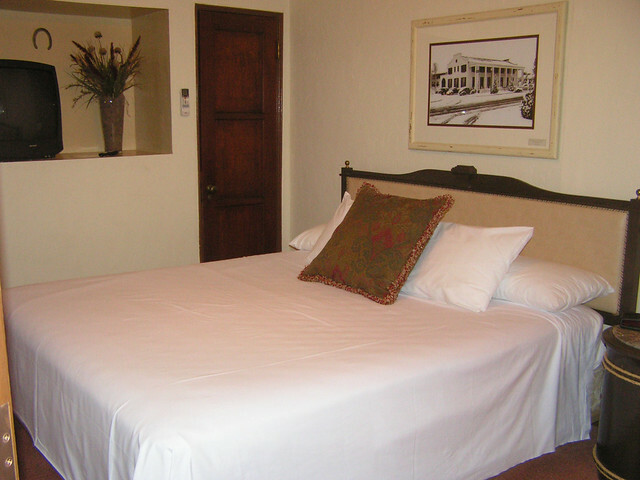 This was our room. Notice that picture on the wall? 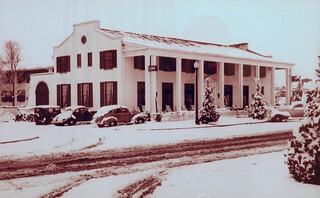 It is the Boulder Dam Hotel at an earlier date. I went out and took a current picture for comparison. Now, last January, we were browsing through an antique mall in the Pensacola, Florida, area and I came upon issue number two of U.S. Camera from January, 1939. 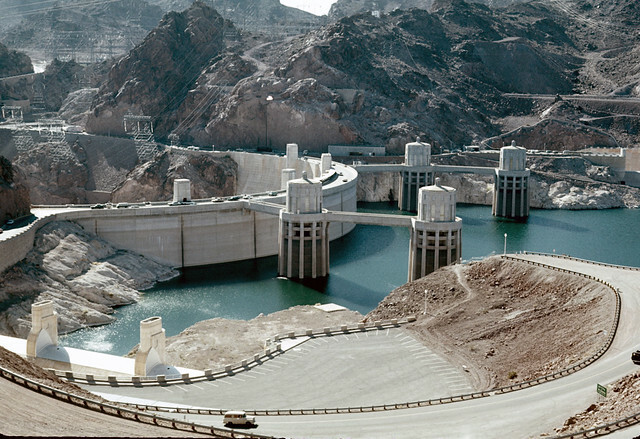 Inside is a feature article on Boulder Dam by Ben Glaha. It has a couple of Glaha's well-known pictures but also has this one titled simply, "Dan." I sent the magazine along to sister-in-law Cindy who promptly told me that there is a statue of Dan in Boulder City. Well, I missed it when we were there. 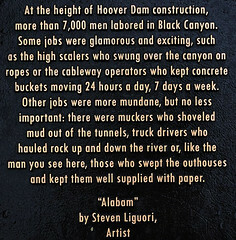 But just a few blocks from the Boulder Dam Hotel, there is indeed a statue of Dan by sculptor, Steven Liguori. He has taken a bit of liberty with the name but that's Dan, don't you think? And here is my other question. In the Glaha photo, Dan appears to be carrying Sycamore Toilet Tissue. 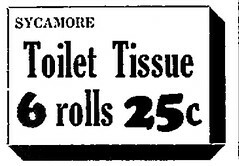 I've found a couple of ads for Sycamore in southern California newspapers in the 1930s but can't seem to find any record of who the manufacturer is. Does anyone know?